The disease Coccidiosis is commonly also known as Cocci. It is seen in the chickens when a microscopic parasite Cocci attaches to the inner lining of the gut. As Cocci cause this disease, the disease is named after that. The chickens are exposed to the Cocci every day, and it might be possible that they develop immunity against the parasite. That’s why younger chickens are more susceptible to the disease because the older chickens have developed the resistance against the disease. Merial Corid powder is the best option for the corid dosage that is readily available online. It is 20% corid soluble powder. The powder is only recommended for Animal use. However, it is not recommended for goats. 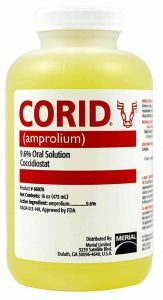 For treating the chickens suffering for Coccidiosis you need to give the Corid dosage to the chickens for five consecutive days. The powder is soluble in water so it should be mixed with water and then given to chickens for the treatment. So the daily dosage recommended is 10mg per kg ( the weight of the chicken). 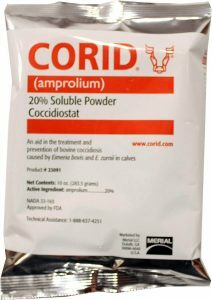 Note: There is 220 mg amprolium per 1 gram of Corid. So calculate accordingly and feed your chickens. There is a prevention protocol that can be used for preventing Coccidiosis. The protocol is to be followed for 21 days in which the corid dosage is given for 21 days. 5 mg amprolium/kg should be given to chickens. This protocol is recommended for preventing the Coccidiosis in chickens. There is a liquid solution of corid also available that can be given to chickens for treatment as well as prevention. This solution has 9.6% amprolium. It can be consumed by humans as well. It can be given with drinking water or as a drench treatment. Add 16 oz of solution per 100 gallons of water in drinking water. You can also give it as drench treatment by adding 3 oz of corid solution to 1 pt of water and give the dosage with the help of syringe at the rate of 1 oz per 100 lb of body weight. Add 8 oz of solution per 100 gallons of water in drinking water. Give it as a drench treatment by adding 1.5 oz of corid solution to 1 pt of water with the syringe dosage at the rate of 1 oz per 100 lb of body weight. How is the disease caused? Once the parasite ( Cocci) attaches to the intestine or the cecal, it starts forming a cyst where it multiplies over the time. Nine different species of Eimora protozoa cause the disease. Different strains of Cocci affect different birds and animals. Chickens might come in contact with Cocci while eating or pecking around in dirt and faeces. More the number of parasites the chickens come in contact to while eating more are the chances of developing this disease Coccidiosis. The most common symptom noted is the loss of appetite and blood or mucus in the faeces. However, it should be kept in mind that the presence of occasional blood in the faeces might be due shedding of the digestive lining which is normal. First of all, if you observe a chicken showing symptoms of Coccidiosis or is detected with the infection keep that bird away from the flock as the infected bird can cause disease in other chickens as well. Coccidiosis occurs in the more warm environment compared to the cold climate. As the corid is mixed with water and then given to birds, it is recommended for treating as well as preventing the disease. The infected birds do not eat due to loss of their appetite, so the corid dosage is easy to give to the birds. First, we will see that how Coccidiosis can be treated followed by its prevention. 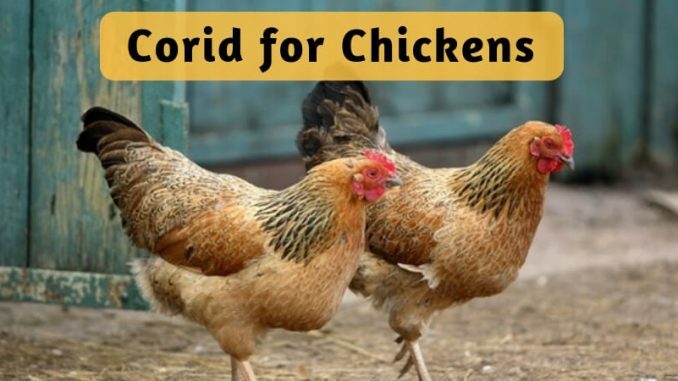 The recommended treatment for treating the infection you can start with the dosage of corid such as it is 10mg per gallon of water for the five consecutive days.As the chickens also suffer from dehydration make sure that birds are staying hydrated. Corid mimics the working of vitamin B1 that is Thiamin. The cocci parasite needs this vitamin for the growth and reproduction. But now as the coccidia has corid, that mimics the mechanism of the vitamin B1 the parasite suffers from the vitamin deficiency. Due to the reduction in the vitamin levels result in the starvation and killing of the parasites. Treating the infected bird for five days makes sure that the bacteria is dead. Vitamin A and Vitamin K supplements are recommended for giving it along the treatment by corid dosage. Mix a little amount of organic apple cider vinegar in the water that you give to chickens. You can also give them yoghurt with little garlic in it to help in increasing the good bacteria in their digestive tracts. The moisture in the environment is the reason for the infection caused by the coccidia parasite so make sure you keep the areas dry and clean to prevent such disease. It is rightly said that the “ prevention is better than cure” as there is a preventive measure for this disease available. The dose of Corid is given for 21 days as mentioned on the product is provided for treatment as well as prevention of Coccidiosis. I hope this article gave you the proper details on the Coccidiosis, its symptoms, causes, treatment, and prevention. You can select the product based on your preferences.